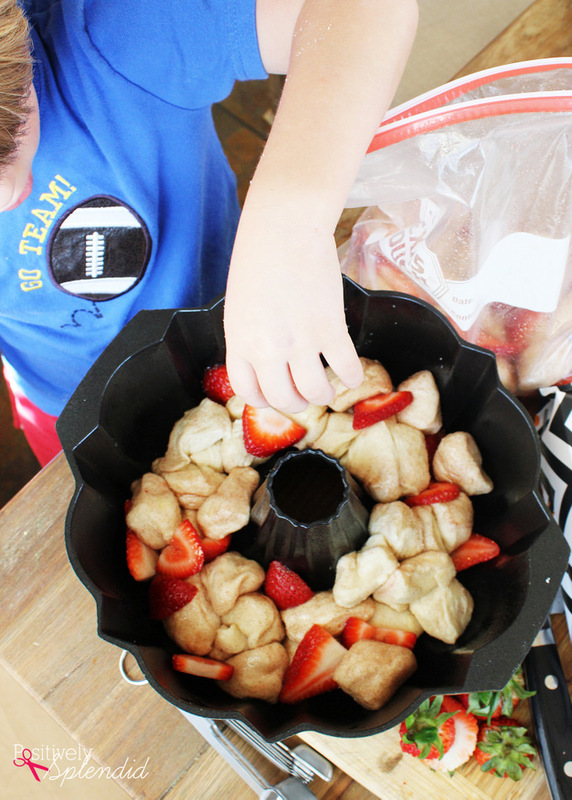 Getting kids in the kitchen is always a fun idea, and especially when the occasion at hand is a chance to show Mom how much she is loved by making her a delicious treat to enjoy on Mother’s Day. 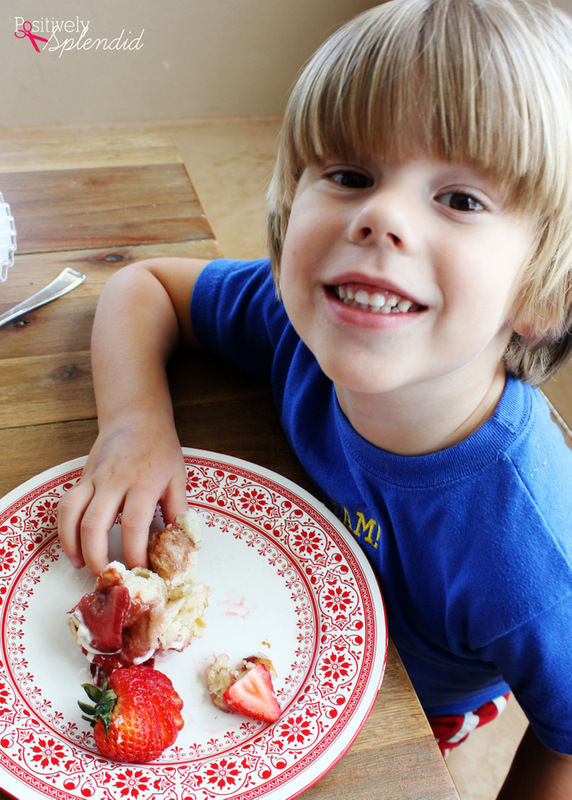 Today, I’ve teamed up with Huggies® to share a recipe that is not only incredibly delicious, but also the perfect way to get kids into the kitchen for some cooking fun! 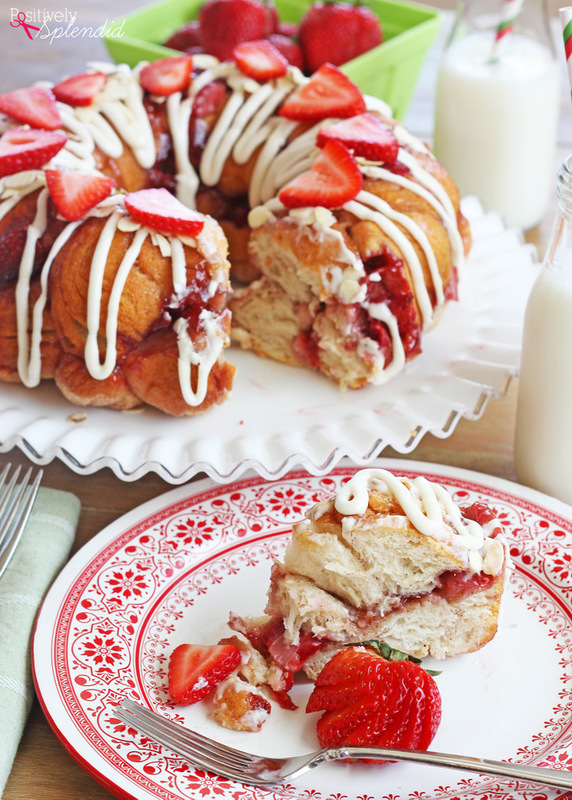 This Strawberry Monkey Bread with Cream Cheese Glaze is my springtime take on our family’s tried-and-true favorite monkey bread, with layers of strawberries and strawberry preserves nestled inside pull-apart dough, all topped off with a tangy cream cheese glaze. 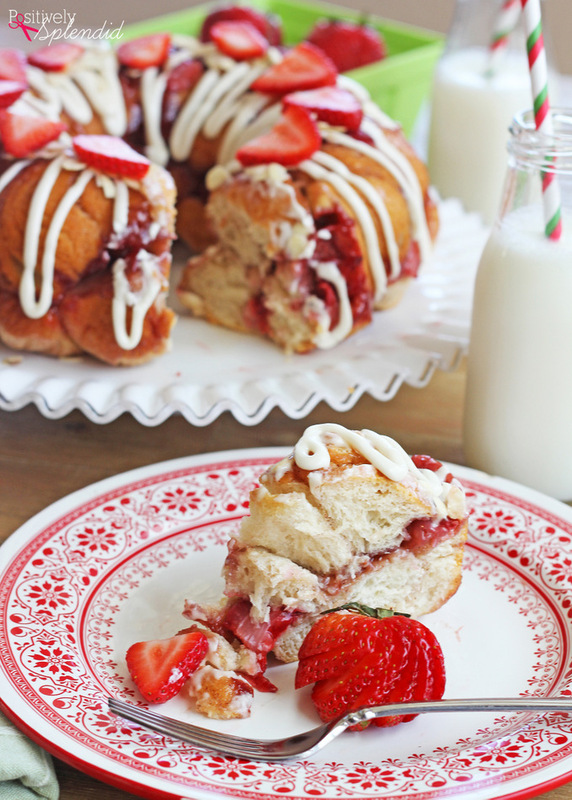 Plan to add this recipe to your Mother’s Day brunch menu for a treat that will make Mom’s day as special as she is! This is a sponsored post written by me on behalf of Huggies®. All opinions are 100% my own. 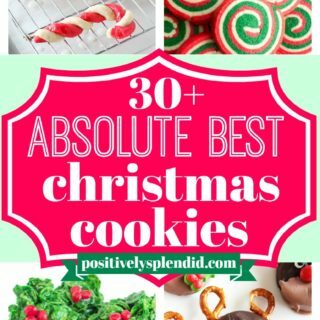 NOTE: For a printable PDF version of this recipe, scroll below. 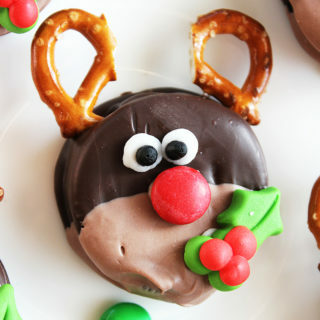 This is such a fun recipe to make with little helpers! To begin, open up the biscuit packages, and separate each one into 8 pieces. 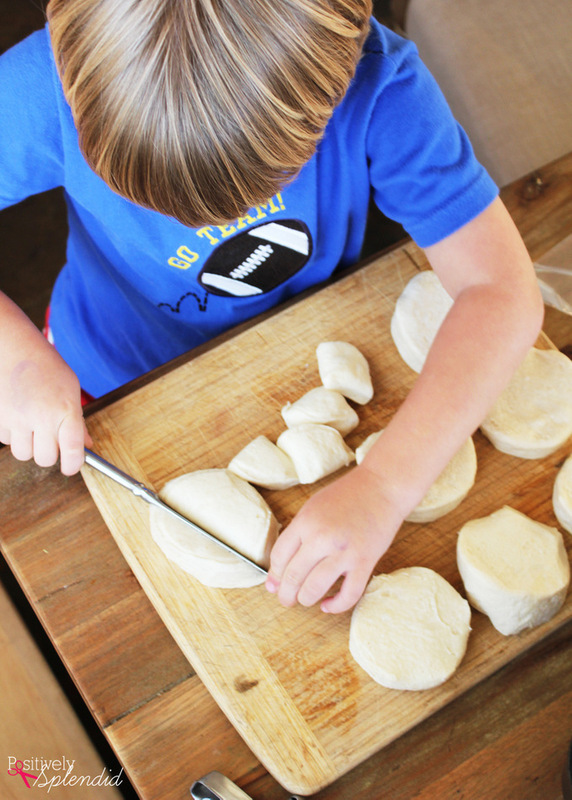 Let kids use a butter knife (or even a pair of clean safety scissors) to cut each biscuit into quarters. 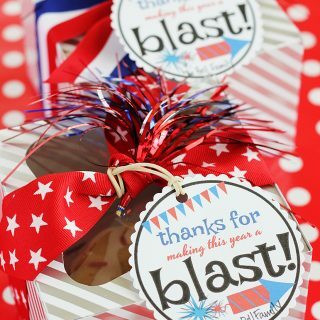 Place the granulated sugar and cinnamon in a gallon-sized zip-top bag, along with the biscuit quarters. Close the bag, and give everything a good shake to coat the biscuits thoroughly with the sugar mixture. My 4-year-old son loves this part best of all! If working with older children, have them carefully slice enough strawberries for 1 1/2 cups, setting aside 1/2 cup for use as a garnish. 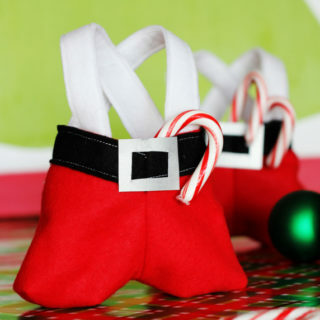 (Little helpers will need assistance with this step.) Place the remaining 1 cups of berries in the bag along with the biscuit/sugar mixture. Close the bag well, and then give everything another good shake to combine. Spray the Bundt pan with non-stick spray before layering 1/2 of the biscuit/berry mixture into the bottom of the pan. As you might imagine, all of the sugar and juice from the berries can make this a pretty sticky step, but that’s all part of the fun! 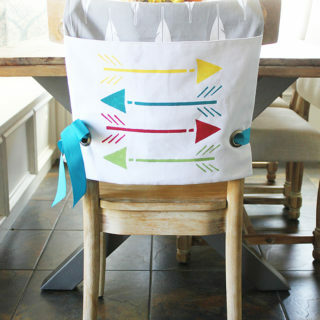 When I’m cooking with my kids, I am never without my container of Huggies® Wipes. 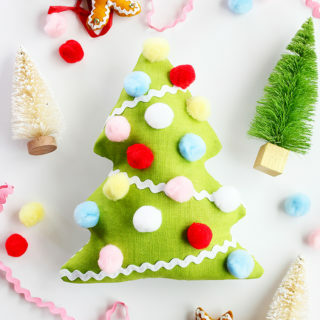 They are so handy for allowing little ones to wipe away and sticky messes on their hands and face without having to take time to make constant trips to the sink. 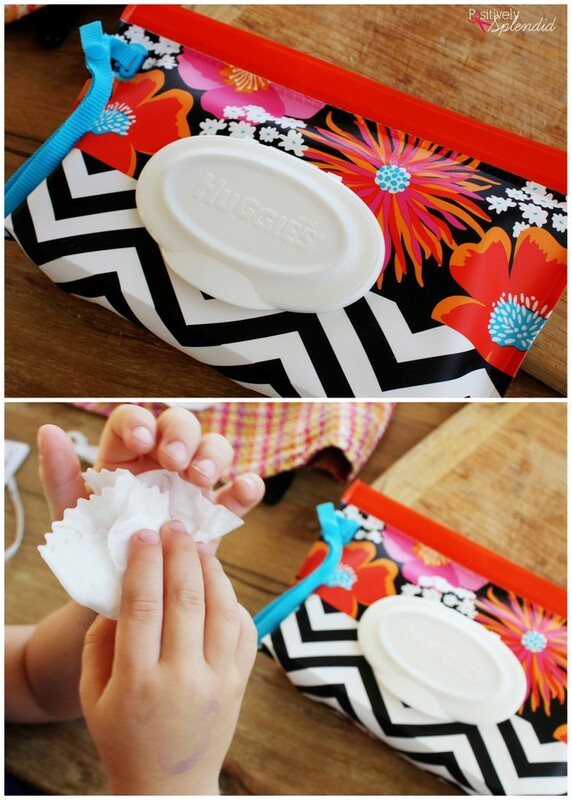 Have you seen the darling new reusable travel wipes packages now available from Huggies®? I have one in every style, and I take them just about everywhere we go: on road trips, to ballgames, to the zoo–you name it. Place the strawberry preserves in a microwave-safe bowl, and microwave on high for 30-60 seconds until the preserves are melted, stirring halfway between cooking to prevent scalding. Carefully pour the preserves over the biscuit layer in the pan before topping everything off with the remaining biscuit/strawberry mixture. 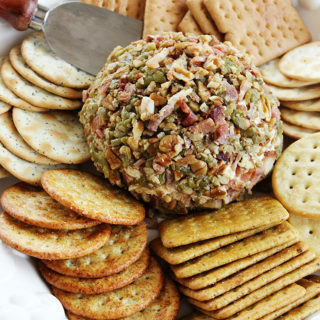 Place the pan in a preheated 350-degree oven and cook for 30-35 minutes, until golden and bubbly. Cool on a wire rack for 10 minutes before inverting onto a serving platter to cool completely. 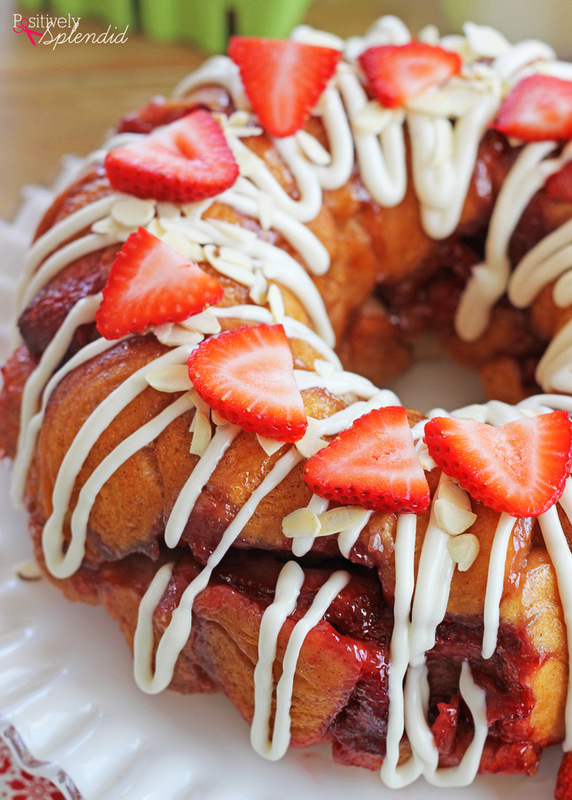 While the monkey bread cools, it’s time to make some yummy glaze to really make things special! Beat the cream cheese at high speed until fluffy. Add the powdered sugar, 1/2 cup at a time, beating well to incorporate. Mix in the vanilla and milk. 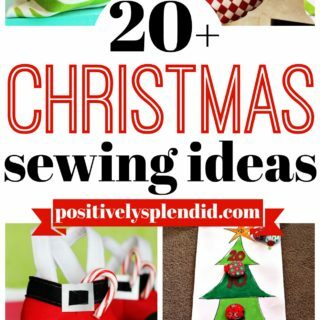 Pour the glaze into a quart-sized zip-top bag and snip off one corner of the bag. 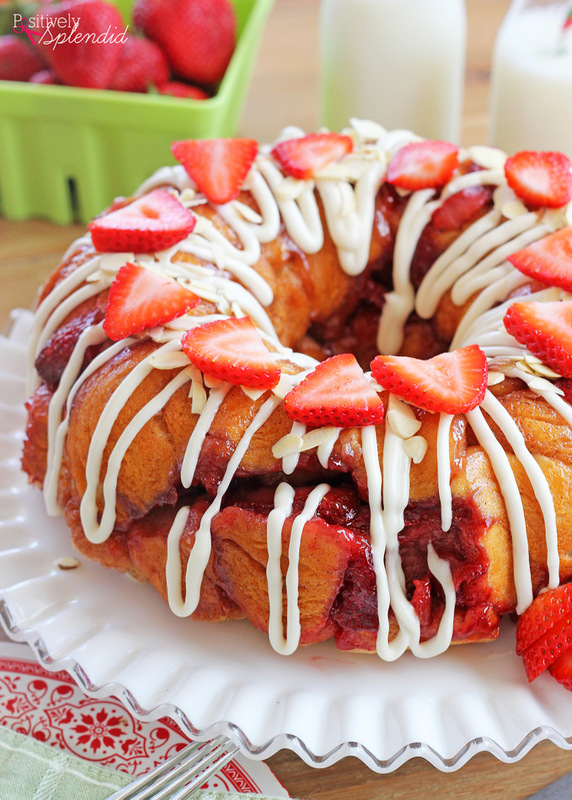 Drizzle and swirl the glaze over the monkey bread before garnishing with the reserved 1/2 cup sliced strawberries and the sliced almonds, if desired. 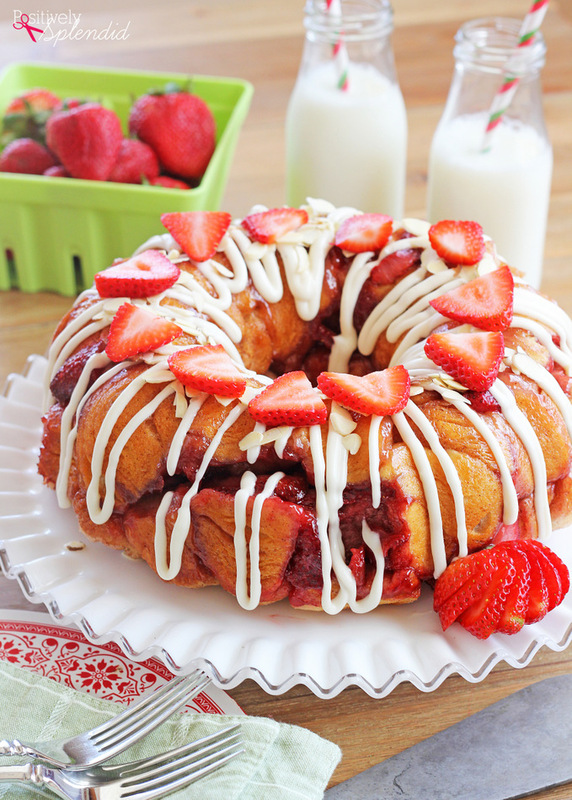 The presentation this Strawberry Monkey Bread with Cream Cheese Glaze makes is so impressive! 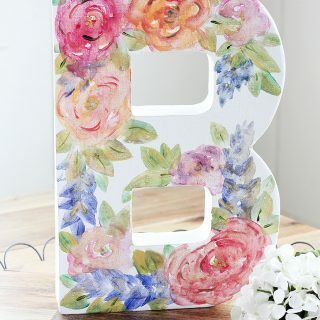 Kids will be so proud to help make something so spectacular for Mom this Mother’s Day. To begin, open up the biscuit packages, and separate each one into 8 pieces. Cut each biscuit into quarters. 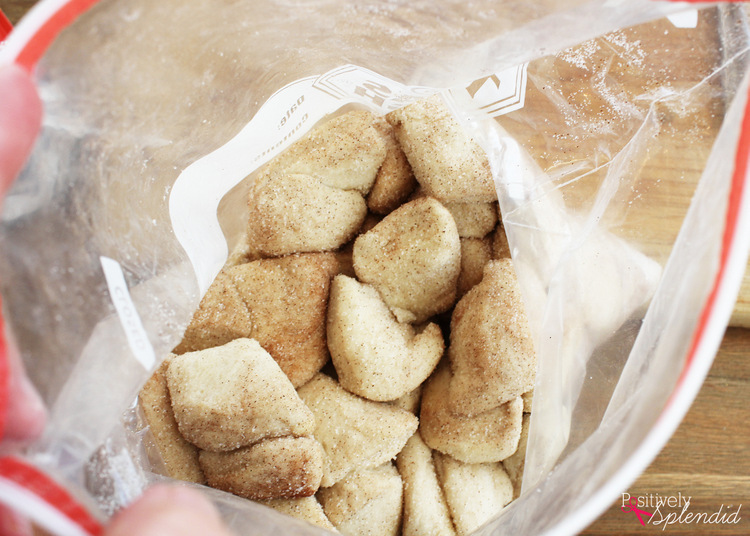 Place the granulated sugar and cinnamon in a gallon-sized zip-top bag, along with the biscuit quarters. Close the bag and shake to coat the biscuits thoroughly with the sugar mixture. 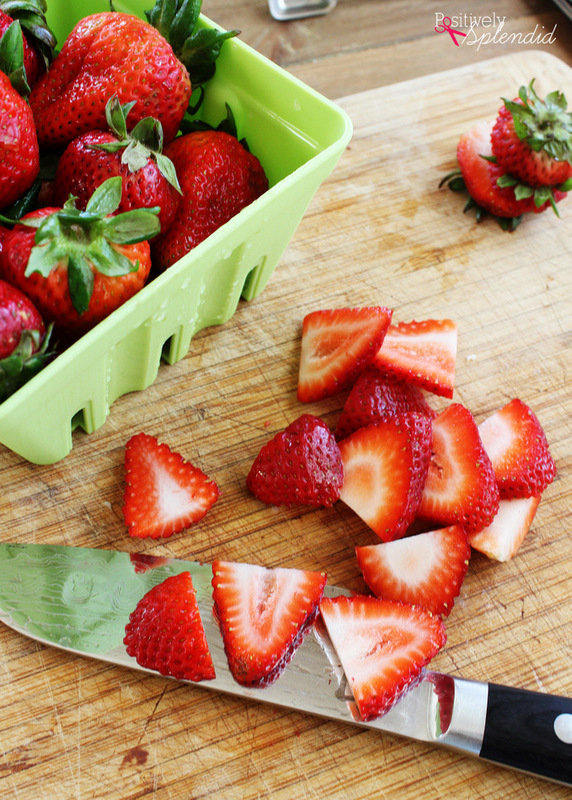 Slice enough strawberries for 1½ cups, setting aside ½ cup for use as a garnish. Place the remaining 1 cup of berries in the bag along with the biscuit/sugar mixture. Close the bag well, and then shake to combine. 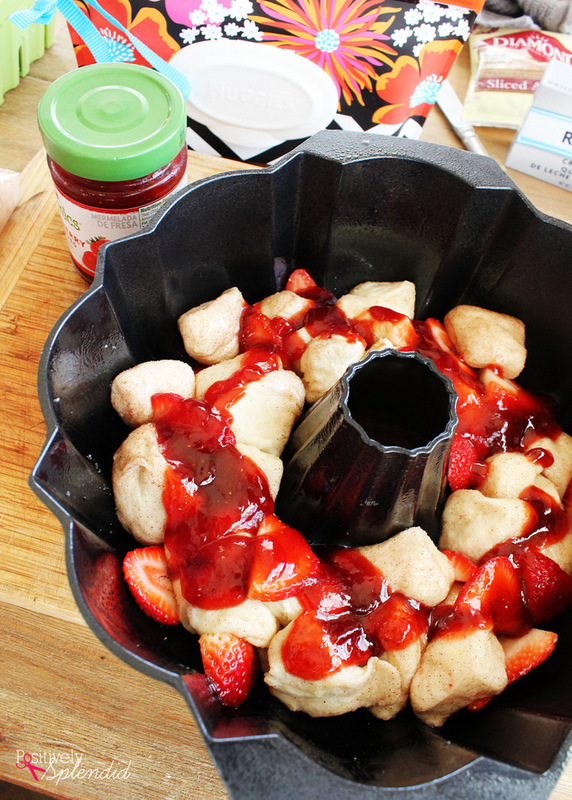 Spray the Bundt pan with non-stick spray before layering ½ of the biscuit/berry mixture into the bottom of the pan. Place the strawberry preserves in a microwave-safe bowl, and microwave on high for 30-60 seconds until the preserves are melted, stirring halfway between cooking to prevent scalding. Carefully pour the preserves over the biscuit layer in the pan before topping with the remaining biscuit/strawberry mixture. While the bread cools, prepare the glaze. 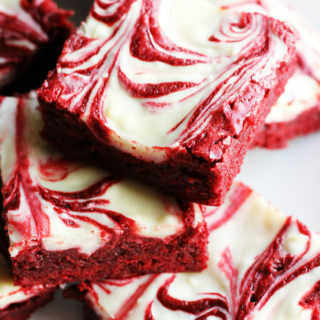 Beat the cream cheese at high speed until fluffy. Add the powdered sugar, ½ cup at a time, beating well to incorporate. Mix in the vanilla and milk. 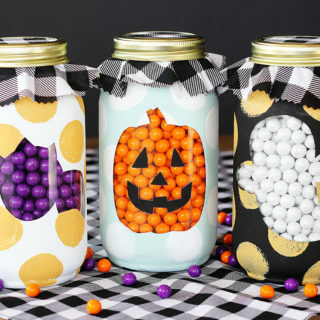 Pour the glaze into a quart-sized zip-top bag and snip off one corner of the bag. 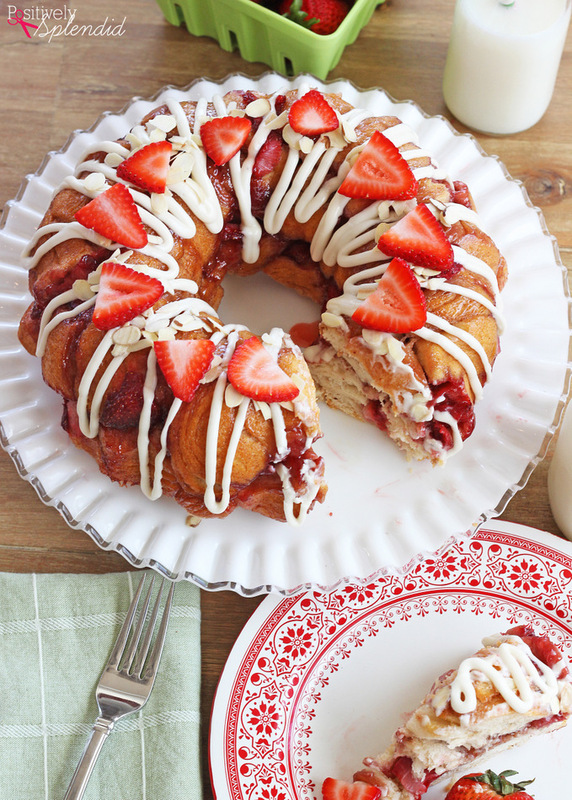 Drizzle and swirl the glaze over the monkey bread before garnishing with the reserved ½ cup sliced strawberries and the sliced almonds, if desired. And now the best part of all: digging right in! Not only are Huggies® Wipes wonderful for cleaning up messes as you cook, they are the perfect solution for sticky hands as you enjoy your homemade treats. My 4-year-old hates sticky hands, but it is so easy for him to grab a wipe and take care of the mess on his own. 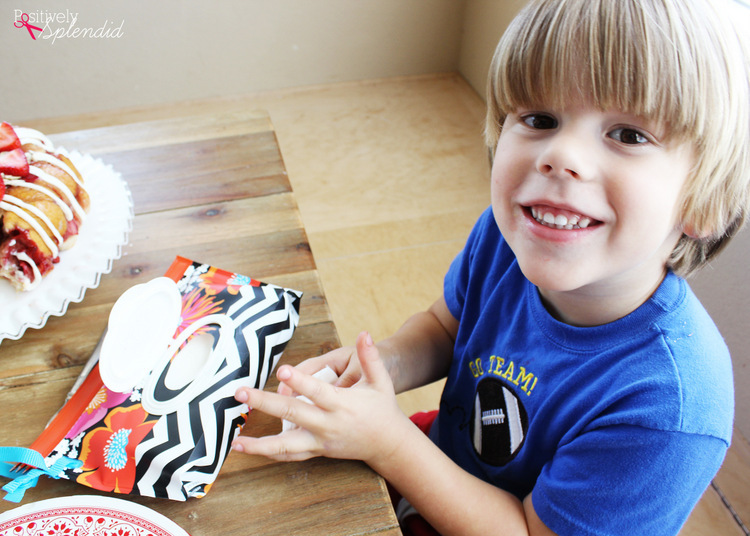 Huggies® Wipes really are one of my favorite sanity savers in the midst of our hectic schedule. They are gentle on skin but their triple layers make them totally up to messy challenges! Life with kids = plenty of messy situations, but Huggies® is giving you the chance to turn those adorable disasters into $2500! Simply enter your child’s messy photo into their Hug the Mess Sweepstakes either on their website or by sharing on Twitter or Instagram using the #HugtheMessSweepstakes hashtag. 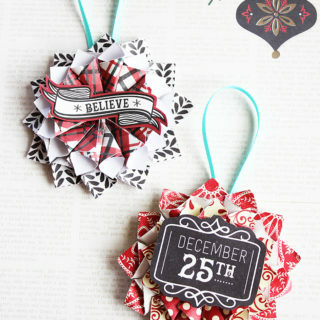 You could be one of FOUR $2500 winners! For even more great inspiration for how Huggies® can help you handle the messes of life with kids, be sure to check them out on Facebook, Twitter and Instagram. 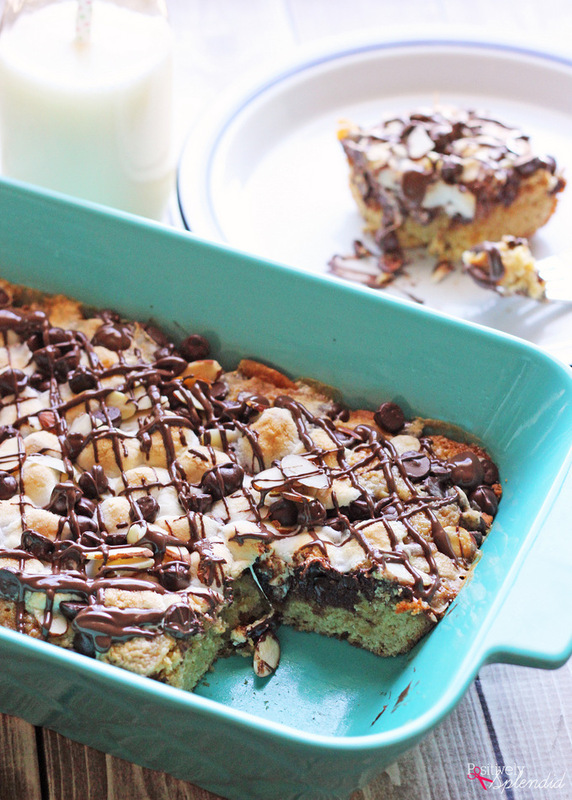 And if you enjoyed this recipe, check out the last Huggies® messy kitchen activity we hosted: making a batch of yummy Rocky Road Blondies!